Foreigners who are legally married to a Thai national may apply for a Non-immigrant O visa based on marriage in Thailand. You can apply to live in Thailand long term if you are married to a Thai or if you have a Thai child or children. The marriage visa for Thailand is issued at a Thai Embassy in your home country and it is normally issued as a single entry visa and valid for 90 days once you enter Thailand. These are the documents need to start the process and will get you a single entry visa or a multiple entry visa. certain embassies want to see at least 100,000 THB in a Thai bank account to issue you with a multiple entry “O” visa or marriage visa. These do vary from embassy to embassy. Once you enter Thailand you have 90 days to extend this visa for 1 year and this process normally takes 3-4 weeks to complete. They will need the following documents for the extension for the visa. As stated the process takes about 3 weeks and you would need to ensure once it is issued that you obtain a re-entry permit to ensure that when you leave Thailand and return that you do not invalidate the extended visa. With this extended visa you do not need to leave Thailand every 3 months to activate another leg of your visa. You only need to report your home address to Thai immigration every 90 days. The process can be difficult so it is always best to speak to a lawyer in Thailand who can assist you with the extension process and the visa application. Speak to us online or in person in Bangkok, Pattaya, Phuket, Samui, Chiang Mai or in Isaan. Hi I am married to a Thai. I just want to go to see my wife for three months. Can you tell me what visa I need and what papers I need? You may apply for a single entry tourist visa valid for 60 days of stay and have this extended for another 30 days at an immigration office once you arrive in Thailand. Kindly contact the Thai embassy or consulate near you for the complete list of requirements. The financial requirement depends on what type of Non Immigrant O Visa you are applying for. For more information, kindly contact the Thai embassy or consulate near you​. Good day. Can I re-new my family O visa whilst I am in Thailand? My current family O visa finishes in July and I would like to re-new without having to go to another country. If you are able to meet the requirements, you can apply for a 1 year extension of your current O visa at a local immigration office. Otherwise, you will have to apply at a Thai embassy or consulate outside of Thailand. I (Indian) am working in Thailand with valid work permit (valid till DEC 16) and my wife is with me with a category O dependent visa (validity 90 days). How can I extend her visa validity same as my work permit? ​Your wife can only apply for a visa extension based on your visa. So if you apply for a visa extension, she can also apply for an extension for the same duration as your visa. Hello, I would like to apply for marriage visa, I possess all documents except monthly income. Can marriage visa be process if no income, but have 400,000 on account. Yes, you may only meet one of the financial requirements. If you already have the 400,000 THB in a Thai bank account, you may apply for a visa extension based on marriage. I have non b and teach, my wife has non o visa. We both are not Thai nationals. What kind of documents will be required to extend her visa which is gonna finished in August? You may contact the immigration office near your place of residence for the complete information. ​You may also visit this website for information on visa extensions depending on the purpose. I would like to know if I still need to go to immigration every 90 days if I get 1 year marriage visa? Is there a difference if a foreign woman marry to Thai man? There is no difference on the requirement for male and female foreigners who marry Thai nationals. If you obtained your 1-year visa inside Thailand, you will need to report to immigration every 90 days. I have a Non Immigrant Type O Spouse Visa Multi Entry just recently obtained in Singapore valid until June 2017. Can I extend this visa from within Thailand next year (we live in Chiang-Mai) without having to leave the country? Finances are not an issue and we have a house; or do I have to arrange again outside the country? It depends if you are able to satisfy the requirements of immigration at the time of your application. 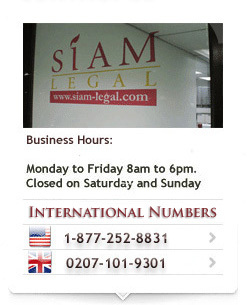 You may contact the immigration office in Chiang Mai for further assistance regarding your inquiry. I got o/a visa retirement since few years, as I am now married, I would like to get mariage visa. My actual visa finished on 31 Dec. What is exact process and at what time do I need to engage the process? We living in Huahin. You will first need to obtain a 90-day Non Immigrant “O” visa from the Thai embassy or consulate in your home country based on marriage. Then upon entry into Thailand, you must meet the financial requirements as stated below. Once you have met the requirements, you can proceed with applying for the 1-year extension based on marriage at the immigration office in Hua Hin during the last 30 days or your 90-day Non Immigrant “O” visa. If you are already married to a Thai national and it is legally recognized in Thailand, you may apply for a 90-day Non Immigrant O visa based on your marriage. You can then apply for an extension of the 90-day visa to a 1-year Marriage visa as long as you have met the requirements for the 1-year Marriage visa.